So it was back to Reading last Monday with the new UJ bearings fitted to Quattro. This time, I left off the spats and locked the rear steering. Keith and Chris from Wycombe Abbey School met Jim and I there as we were planning to do some tests on the Greenpower car (Free Wheelie) at the same time. We were also met by Graham Sparey-Taylor who was hoping to have his Quattro there but unfortunately ran out of time to complete the latest modifications. The tests we can do at present are still not very scientific but the bottom line is “how fast does it go mister?” Well the answer is a bit faster than last time. The weather conditions were much better with a temperature of about 24deg and very little wind. I was able to maintain 30mph (48kph) reasonably comfortably with a number of laps at 32mph (51kph) and after a pep talk from Dr Graham a sprint lap at 35mph (56kph)! At the very beginning of my Quattro development, 35mph was the magic number that I was trying to achieve as a racing speed. This is generally about the average speed of the winner (Steve in the Beano) of most BHPC races. Unfortunately one fast lap around Reading Velodrome is not the same as a 40 minute race on a twisty cycle racing circuit but at least it is a step in the right direction. Forgive me for the next bit, as it is largely a repeat of my original Quattro article for our club magazine but with some of the numbers updated. The power required to maintain 35mph is made up of two main elements. Where Cd is the drag coefficient, A is the frontal area in m², ρ is air density (1.2kg/m³ at 20°C) and V is the speed in m/s. Where Cr is the rolling resistance coefficient, V is the speed in m/s and N is the normal force in Newtons (kgx9.81) on the tyre. There are other mechanical losses such as bearings and chain friction but these are small and I will ignore them in the following examples. The Cd for the Beano is probably about 0.12 taking into account gaps, wheels etc. The frontal area is 0.35m². The Cr is about 0.006 for good cycle tyres, Steve weighs about 65kg and the Beano about 17kg giving a total weight of 82kg. Therefore Steve needs to put out about 169W to maintain 35mph in the Beano. The frontal area of Quattro is about 0.6m². Let us assume the drag coefficient is the same value of the Beano at 0.12. If I was to use my Solidworks CFD drag figures of 6N at 15m/s this would give only 90W which I don’t believe, as there is no account for gaps, rotating wheels etc. More on this another time. Again assuming a Cr of 0.006, I weigh about 76kg and Quattro weighs 34kg giving a total weight of 110kg. This makes a total of 260W which is the high end of an attainable figure for me and gives an idea of what I am up against! Putting things in to perspective, a racing cyclist in a crouch position has a frontal area of about 0.3m² and a Cd of 0.9. This makes a whopping 678W! 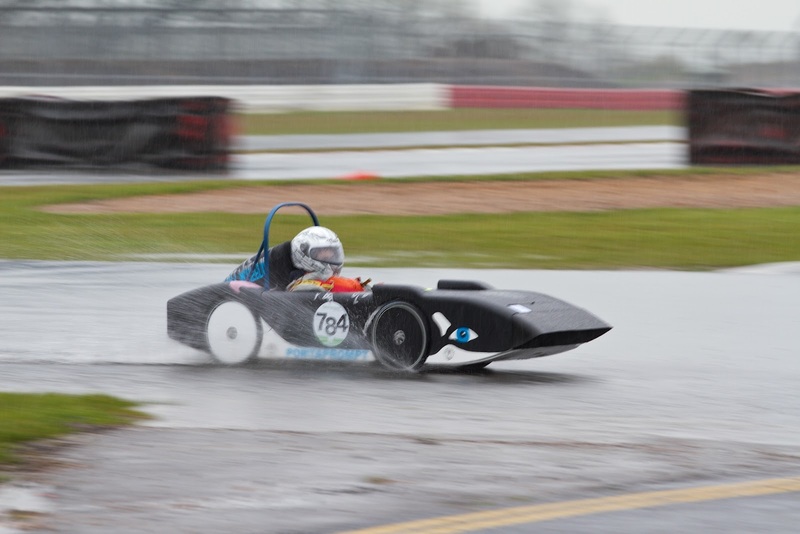 The Greenpower events are aimed at secondary school children, are all four hour endurance races and are generally held at motorsport venues around the UK. All teams have the same motor and six 12 volt batteries to be used in pairs. During the race at least five team members must drive the car, and up to six further members can act as pit crew. Other than the motor and batteries, teams are free to design a car from scratch, or build one of the kit cars. All cars must follow a set of strict safety regulations but there is quite a variety of designs sitting on the grid before a race. 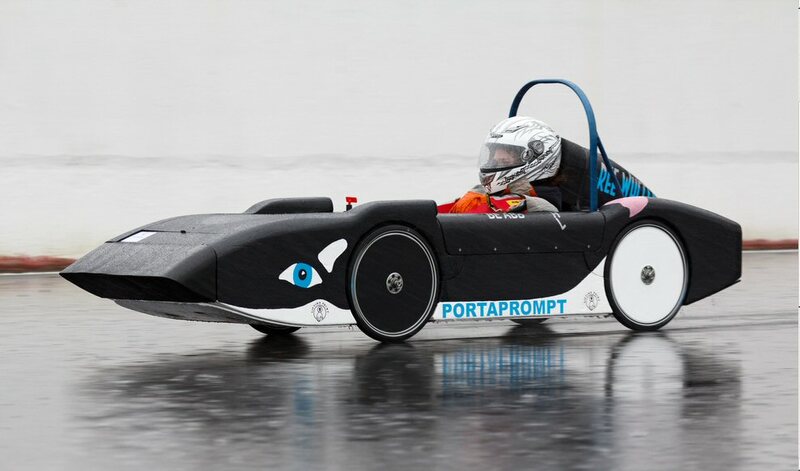 The same equations can also be applied to Greenpower Electric Cars but at the moment the target speed is 25mph (40kph) for the Wycombe Abbey School car. Again there is a bit of guesswork for the Cd of Free Wheelie but it is probably about 0.25 taking into account gaps, wheels etc. The frontal area is about 0.35m² and the speed is 11m/s. At the moment, the car is fitted with 16” (349) Schwalbe Marathon tyres. These were one of the tyres tested by John Lafford. http://www.hadland.me.uk/rolrec10a.pdf He found they had a Cr of 0.01, Keith weighs 80kg and the car about 95kg giving a total weight of 175kg. This makes a total of 259W. So it seems that at 25mph the rolling resistance is dominant. If the tyres were changed for ones with a Cr of 0.006, and the weight reduced with a 20kg lighter driver, the rolling resistance power could be reduced to 0.006x11x155x9.81=100W. As can be seen from the Reading picture, teacher Keith is a little large for the car as it is designed for smaller and lighter young ladies. His shoulders are causing extra air drag and a pupil would probably weigh 20kg less. The aim of the trip to reading with Free Wheelie was to find the optimum gear to use at the next race. Greenpower cars have the opposite problem to human powered vehicles in that, the motor spins at about 1850rpm rather than the 90rpm of leg power. To get the correct wheel speed, the car has a 14t freewheel on the motor and a 5 speed block on the axle with 47t, 50t, 53t, 57t and 62t sprockets which are selectable with a standard rear mech. At the moment, the gear ratio is selected before the race, based on battery capacity, race conditions and duration; it is not touched during the event. Most of the circuits are flat and the motor becomes horribly inefficient if it is run too slowly, which would flatten the batteries before the end of the race. The two 12V batteries can provide about 17Amps to the 24Volt motor for the 80minutes before they are changed. This gives a motor input power of 24x17=408W, taking off a bit for controller, contactor and wiring losses probably leaves 400W. 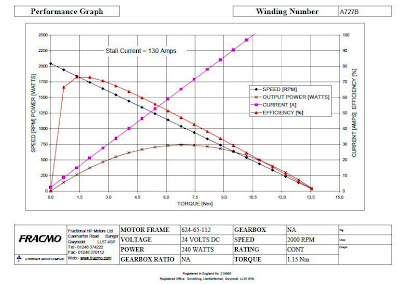 At 17Amps, the motor is running at about 73% efficiency, which is near its peak. 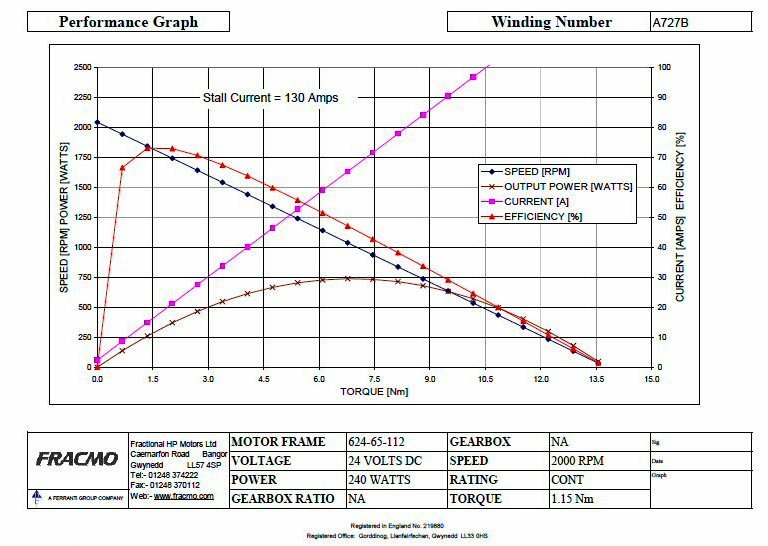 This means there should be 292Watts at the output shaft. Working backwards from this power, using the same equations, with a lighter driver and better tyres (0.006), gives a theoretical speed of 14.5m/s or 32.4mph (52kph) with the rolling power at 132W and air power at 160W. The next Greenpower event is on Sunday 10th June at Goodwood Motor Circuit and the aim is to complete the four hour race without any major breakdowns or flat batteries. The team will be using the Schwalbe Marathon Tyres and starting on a low gear. The gear could be increased at the first battery change, depending on the battery condition. I'll not be there, as I am going to be splashing about at Fowlmead in the World Championships. The weather forecast is not very good, which is a shame but in Quattro, it may give me an advantage over some of the bikes.